Benedict Carey offers context, summary, and reactions to the recent Science article reporting work of a consortium of 270 scientists on five continents led by psychologist Brian Nosek at the University of Virginia. (Other commentaries on this work are offered by Bohannon and by The Guardian.) The bottom line is that only 36 percent of the findings from almost 100 studies in the top three psychology journals held up when the original experiments were rigorously redone. This work was an 'inside job,' with psychologists doing the replication attempts communicating with cooperative original researchers. Carey describes a culture change that is taking hold in the psychological research community, towards greater transparency, data sharing, and preregistration of studies with journals that spells out hypotheses and how they are going to be tested. "Doing this upfront is a powerful check against moving the goal posts on a study — that is, analyzing the data and working backward, reverse-engineering the “hypothesis” to fit those findings." Posttraumatic stress disorder is characterized by a resistance to extinction learning and dysregulated signaling of the neurotransmitter norepinephrine. Previous research suggested the prelimbic and infralimbic subdivisions of the medial prefrontal cortex (mPFC) regulate fear expression and suppression, respectively. However, noradrenergic signaling in response to psychological stress may disrupt mPFC function, contributing to extinction deficits. Here we show, for the first time to our knowledge, that footshock stress dysregulates mPFC spike firing; this can be stabilized by propranolol, a β-noradrenergic receptor blocking drug, which in turn facilitates extinction when it normally fails. These findings suggest that propranolol may be a particularly effective adjunct to behavioral therapy soon after trauma, when stress is high, at least in part by normalizing prefrontal cortical function. Stress-induced impairments in extinction learning are believed to sustain posttraumatic stress disorder (PTSD). Noradrenergic signaling may contribute to extinction impairments by modulating medial prefrontal cortex (mPFC) circuits involved in fear regulation. Here we demonstrate that aversive fear conditioning rapidly and persistently alters spontaneous single-unit activity in the prelimbic and infralimbic subdivisions of the mPFC in behaving rats. These conditioning-induced changes in mPFC firing were mitigated by systemic administration of propranolol (10 mg/kg, i.p. ), a β-noradrenergic receptor antagonist. Moreover, propranolol administration dampened the stress-induced impairment in extinction observed when extinction training is delivered shortly after fear conditioning. These findings suggest that β-adrenoceptors mediate stress-induced changes in mPFC spike firing that contribute to extinction impairments. Propranolol may be a helpful adjunct to behavioral therapy for PTSD, particularly in patients who have recently experienced trauma. Recent financial scandals highlight the devastating consequences of corruption. While much is known about individual immoral behavior, little is known about the collaborative roots of corruption. In a novel experimental paradigm, people could adhere to one of two competing moral norms: collaborate vs. be honest. Whereas collaborative settings may boost honesty due to increased observability, accountability, and reluctance to force others to become accomplices, we show that collaboration, particularly on equal terms, is inductive to the emergence of corruption. When partners' profits are not aligned, or when individuals complete a comparable task alone, corruption levels drop. These findings reveal a dark side of collaboration, suggesting that human cooperative tendencies, and not merely greed, take part in shaping corruption. Cooperation is essential for completing tasks that individuals cannot accomplish alone. Whereas the benefits of cooperation are clear, little is known about its possible negative aspects. Introducing a novel sequential dyadic die-rolling paradigm, we show that collaborative settings provide fertile ground for the emergence of corruption. In the main experimental treatment the outcomes of the two players are perfectly aligned. Player A privately rolls a die, reports the result to player B, who then privately rolls and reports the result as well. Both players are paid the value of the reports if, and only if, they are identical (e.g., if both report 6, each earns €6). Because rolls are truly private, players can inflate their profit by misreporting the actual outcomes. Indeed, the proportion of reported doubles was 489% higher than the expected proportion assuming honesty, 48% higher than when individuals rolled and reported alone, and 96% higher than when lies only benefited the other player. Breaking the alignment in payoffs between player A and player B reduced the extent of brazen lying. Despite player B's central role in determining whether a double was reported, modifying the incentive structure of either player A or player B had nearly identical effects on the frequency of reported doubles. Our results highlight the role of collaboration—particularly on equal terms—in shaping corruption. These findings fit a functional perspective on morality. When facing opposing moral sentiments—to be honest vs. to join forces in collaboration—people often opt for engaging in corrupt collaboration. ...if you listen to a recorded symphony through stereo speakers that are placed exactly right, the orchestra will sound like it’s inside your head. Obviously that isn’t the case...You might find yourself asking well-meaning but preposterous scientific questions like “Where in the brain is the woodwinds section located?” ..A more reasonable approach is not to ask...How does the brain construct this experience of hearing the orchestra in your head? Most people, including many scientists, believe that emotions are distinct, locatable entities inside us — but they’re not. Searching for emotions in this form is as misguided as looking for cerebral clarinets and oboes. The Interdisciplinary Affective Science Laboratory (which I direct) collectively analyzed brain-imaging studies published from 1990 to 2011 that examined fear, sadness, anger, disgust and happiness. We divided the human brain virtually into tiny cubes, like 3-D pixels, and computed the probability that studies of each emotion found an increase in activation in each cube...Overall, we found that no brain region was dedicated to any single emotion. We also found that every alleged “emotion” region of the brain increased its activity during nonemotional thoughts and perceptions as well. Brain regions like the amygdala are certainly important to emotion, but they are neither necessary nor sufficient for it. In general, the workings of the brain are not one-to-one, whereby a given region has a distinct psychological purpose. Instead, a single brain area like the amygdala participates in many different mental events, and many different brain areas are capable of producing the same outcome. Emotions like fear and anger, my lab has found, are constructed by multipurpose brain networks that work together. If emotions are not distinct neural entities, perhaps they have a distinct bodily pattern — heart rate, respiration, perspiration, temperature and so on? Again, the answer is no. My lab analyzed over 200 published studies, covering nearly 22,000 test subjects, and found no consistent and specific fingerprints in the body for any emotion. Instead, the body acts in diverse ways that are tied to the situation. Stress can cause bad food choices and compromise long term goals. Maier et al. show that more immediate rewards are likely to be chosen following stress because stress increases immediate reward signaling in the amygdala and striatum during choice. Subjects were stressed by having to hold a hand in ice water as long as possible, and then asked to select between more and less healthy food choices while in an MRI scanner, knowing that they would be expected to eat of their picks at the end of the test. Important decisions are often made under stressful circumstances that might compromise self-regulatory behavior. Yet the neural mechanisms by which stress influences self-control choices are unclear. We investigated these mechanisms in human participants who faced self-control dilemmas over food reward while undergoing fMRI following stress. We found that stress increased the influence of immediately rewarding taste attributes on choice and reduced self-control. This choice pattern was accompanied by increased functional connectivity between ventromedial prefrontal cortex (vmPFC) and amygdala and striatal regions encoding tastiness. Furthermore, stress was associated with reduced connectivity between the vmPFC and dorsolateral prefrontal cortex regions linked to self-control success. Notably, alterations in connectivity pathways could be dissociated by their differential relationships with cortisol and perceived stress. Our results indicate that stress may compromise self-control decisions by both enhancing the impact of immediately rewarding attributes and reducing the efficacy of regions promoting behaviors that are consistent with long-term goals. There are persistent socioeconomic disparities in many aspects of child development in America. Relative to their affluent peers, children of low socioeconomic status (SES) complete fewer years of education, have a higher prevalence of health problems, and are convicted of more criminal offenses. Based on research indicating that low self-control underlies some of these disparities, policymakers have begun incorporating character-skills training into school curricula and social services. However, emerging data suggest that for low-SES youth, self-control may act as a “double-edged sword,” facilitating academic success and psychosocial adjustment, while at the same time undermining physical health. Here, we examine this hypothesis in a five-wave study of 292 African American teenagers from rural Georgia. From ages 17 to 20 y, we assessed SES and self-control annually, along with depressive symptoms, substance use, aggressive behavior, and internalizing problems. At age 22 y, we obtained DNA methylation profiles of subjects’ peripheral blood mononuclear cells. These data were used to measure epigenetic aging, a methylation-derived biomarker reflecting the disparity between biological and chronological aging. Among high-SES youth, better mid-adolescent self-control presaged favorable psychological and methylation outcomes. However, among low-SES youth, self-control had divergent associations with these outcomes. Self-control forecasted lower rates of depressive symptoms, substance use, aggressive behavior, and internalizing problems but faster epigenetic aging. These patterns suggest that for low-SES youth, resilience is a “skin-deep” phenomenon, wherein outward indicators of success can mask emerging problems with health. These findings have conceptual implications for models of resilience, and practical implications for interventions aimed at ameliorating social and racial disparities. In five studies, we tested the link between personality and geography. We found that mountain-lovers were more introverted than ocean-lovers (Study 1). People preferred the ocean over mountains when they wanted to socialize with others, but they preferred the mountains and the ocean equally when they wanted to decompress alone (Study 2). In Study 3, we replicated the introversion–extraversion differences using pictures of mountains and oceans. Furthermore, this difference was explained in part by extraverts’ perception that it would take more work to have fun in the mountains than in the ocean. Extending the first three studies to non-students, we found that residents of mountainous U.S. states were more introverted than residents of flat states (Study 4). In Study 5, we tested the link between introversion and the mountains experimentally by sending participants to a flat, open area or a secluded, wooded area. The terrain did not make people more introverted, but introverts were happier in the secluded area than in the flat/open area, which is consistent with the person–environment fit hypothesis. I just came across an article in my queue of potential posts by Steven Quantz and Anette Asp that I had put aside, thinking to check whether this was the same Quantz who I vaguely remember reviewing my Biology of Mind book some time ago. I hunted down the review (in Trends in Neuroscience, May 2000) and sure enough, it is the same guy, then and now at Cal Tech, a professor of philosophy who atempts to relate advances in understanding the neuroscience of the brain to the humanities and social sciences, in fields such as neuroethics, neuroaesthetics, and neuroeconomics. His piece with Asp in the NY Times Sunday Review deals with the same topic as my July 10 post, "Why don't the poor rise up? ", and takes another perspective, described in their recent book "Cool"- How the Brain’s Hidden Quest for Cool Drives Our Economy and Shapes Our World. ...inequality is increasingly disorganized. Consumerism has expanded the lifestyles, niches and brands that supply the statuses we seek. By the 1950s, rapidly rising standards of living across the West, combined with social pressures to conform, all conspired to intensify status competition. The architects of “rebel cool,” like Jack Kerouac and Norman Mailer, responded by rebelling against emulation consumption and the status hierarchy of postwar America. They inverted the dominant social hierarchy, rejecting the values of those at the top and appropriating the values of those who had been marginalized at the bottom. Asking people merely to look at products and people they considered “cool” sparks a pattern of brain activation in the medial prefrontal cortex — a part of the brain that is involved in daydreaming, planning and ruminating — similar to what happens when people receive praise. Our brain’s medial prefrontal cortex, in short, tracks our social esteem. A new generation of ethnographers has discovered an explosion of consumer lifestyles and product diversification in recent decades. From evangelical Christian Harley-Davidson owners...to lifestyles organized around musical tastes, from the solidarity of punk rockers to yoga gatherings, from meditation retreats to book clubs, we use products to create and experience community. These communities often represent a consumer micro-culture, a “brand community,” or tribe, with its own values and norms about status. The proliferation of consumer choice helps explain why today’s Gilded Age hasn’t sparked as much outrage as the last one. Money may not buy happiness in the long run, but consumer choice has gone a long way in keeping most Americans reasonably content, even if they shouldn’t be. I pass on this interesting bit of information because I, like my father and grandfather, am addicted to hot sauce containing chili peppers (use it with every breakfast). Their main ingredient is capsaicin, which is known to have antioxidant and anti-inflammatory properties. A huge Chinese study of 485,000 people over an average of more than seven years found consuming spicy food once a day correlated with a 14% reduction in risk of death, and also reduced rates of ischemic heart disease, respiratory diseases and cancers. Tracking ongoing cognition with fMRI of functional connectivity states. Functional connectivity (FC) patterns in functional MRI exhibit dynamic behavior on the scale of seconds, with rich spatiotemporal structure and limited sets of whole-brain, quasi-stable FC configurations (FC states) recurring across time and subjects. Based on previous evidence linking various aspects of cognition to group-level, minute-to-minute FC changes in localized connections, we hypothesized that whole-brain FC states may reflect the global, orchestrated dynamics of cognitive processing on the scale of seconds. To test this hypothesis, subjects were continuously scanned as they engaged in and transitioned between mental states dictated by tasks. FC states computed within windows as short as 22.5 s permitted robust tracking of cognition in single subjects with near perfect accuracy. Accuracy dropped markedly for subjects with the lowest task performance. Spatially restricting FC information decreased accuracy at short time scales, emphasizing the distributed nature of whole-brain FC dynamics, beyond univariate magnitude changes, as valuable markers of cognition. Anti-aging therapies? Start by quantifying aging in young adults for early intervention. Belsky et al. show that aging processes can be quantified in people still young enough for prevention of age-related disease, opening a new door for antiaging therapies. Antiaging therapies show promise in model organism research. Translation to humans is needed to address the challenges of an aging global population. Interventions to slow human aging will need to be applied to still-young individuals. However, most human aging research examines older adults, many with chronic disease. As a result, little is known about aging in young humans. We studied aging in 954 young humans, the Dunedin Study birth cohort, tracking multiple biomarkers across three time points spanning their third and fourth decades of life. We developed and validated two methods by which aging can be measured in young adults, one cross-sectional and one longitudinal. Our longitudinal measure allows quantification of the pace of coordinated physiological deterioration across multiple organ systems (e.g., pulmonary, periodontal, cardiovascular, renal, hepatic, and immune function). We applied these methods to assess biological aging in young humans who had not yet developed age-related diseases. Young individuals of the same chronological age varied in their “biological aging” (declining integrity of multiple organ systems). Already, before midlife, individuals who were aging more rapidly were less physically able, showed cognitive decline and brain aging, self-reported worse health, and looked older. Measured biological aging in young adults can be used to identify causes of aging and evaluate rejuvenation therapies. Exercise for the aging brain - how much is necessary? Gretchen Reynolds points to interesting work on exercise and the aging brain by Vidoni et. al. Increasing amounts of aerobic exercise (75, 150, 225 minutes per week of walking) correlated with correspondingly increased cardiorespiratory fitness, but the degree of improvement in thinking skills, compared with non-exercising controls, was the same regardless of the duration of exercise. This suggests that a small dose of exercise may be sufficient to improve many aspects of thinking. Distributing the spoils of a joint enterprise on the basis of work contribution or relative productivity seems natural to the modern Western mind. But such notions of merit-based distributive justice may be culturally constructed norms that vary with the social and economic structure of a group. In the present research, we showed that children from three different cultures have very different ideas about distributive justice. Whereas children from a modern Western society distributed the spoils of a joint enterprise precisely in proportion to productivity, children from a gerontocratic pastoralist society in Africa did not take merit into account at all. Children from a partially hunter-gatherer, egalitarian African culture distributed the spoils more equally than did the other two cultures, with merit playing only a limited role. This pattern of results suggests that some basic notions of distributive justice are not universal intuitions of the human species but rather culturally constructed behavioral norms. Knowing the internal states of ourselves and of others. Vitality form is a term that describes the style with which motor actions are performed (e.g., rude, gentle, etc.). They represent one characterizing element of conscious and unconscious bodily communication. Despite their importance in interpersonal behavior, vitality forms have been, until now, virtually neglected in neuroscience. Here, using the functional MRI (fMRI) technique, we investigated the neural correlates of vitality forms in three different tasks: action observation, imagination, and execution. Conjunction analysis showed that, in all three tasks, there is a common, consistent activation of the dorsocentral sector of the insula. In addition, a common activation of the parietofrontal network, typically active during arm movements production, planning, and observation, was also found. We conclude that the dorsocentral part of the insula is a key element of the system that modulates the cortical motor activity, allowing individuals to express their internal states through action vitality forms. Recent monkey anatomical data show that the dorsocentral sector of the insula is, indeed, connected with the cortical circuit involved in the control of arm movements. People overestimate their knowledge, at times claiming knowledge of concepts, events, and people that do not exist and cannot be known, a phenomenon called overclaiming. What underlies assertions of such impossible knowledge? We found that people overclaim to the extent that they perceive their personal expertise favorably. A first set of studies showed that self-perceived financial knowledge positively predicts claiming knowledge of nonexistent financial concepts (invented by the researchers: pre-rated stocks, fixed-rate deduction, annualized credit), independent of actual knowledge. A second study demonstrated that self-perceived knowledge within specific domains (e.g., biology) is associated specifically with overclaiming within those domains (taking the fictitious terms meta-toxins, bio-sexual, and retroplex to be real). In another study, warning participants that some of the concepts they saw were fictitious did not reduce the relationship between self-perceived knowledge and overclaiming, which suggests that this relationship is not driven by impression management. Finally, boosting self-perceived expertise in geography (by having participants take an easy versus difficult geography quiz) prompted assertions of familiarity with nonexistent places, which supports a causal role for self-perceived expertise in claiming impossible knowledge. The authors note this line by American historial Daniel Boorstin (1914-2004): "The menace to understanding is not so much ignorance as the illusion of knowledge." 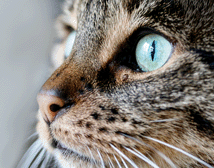 Slit-eyed animals have either vertical or horizontal pupils. It is unclear whether one orientation conveys any sort of competitive advantage over the other, and if so, under what circumstances. Banks et al. suggest that the optics of vertical pupil slits generally benefit predators, whereas the optics of horizontal slits benefit prey. Vertical slits are better for estimating object distance and distances along the ground—perfect for a predator stalking its prey. In contrast, horizontal slits are better for seeing objects on the horizon—ideal for prey seeing an approaching predator and deciding which way to flee. Are Chatbots destined to become our most sympathetic listeners? Markoff and Mozur do a fascinating piece in the NYTimes describing how millions of young Chinese use a smartphone program as their intimate companion. Xiaoice (pronounced Shao-ice) can chat with so many people for hours on end because she is not real. She is a chatbot, a program introduced last year by Microsoft that has become something of a hit in China. It is also making the 2013 film “Her,” in which the actor Joaquin Phoenix plays a character who falls in love with a computer operating system, seem less like science fiction. The program remembers details from previous exchanges with users, such as a breakup with a girlfriend or boyfriend, and asks in later conversations how the user is feeling. Xiaoice is a text-messaging program; the next version will include a Siri-like voice so people can talk with Xiaoice. The Microsoft App website lists a few simple English language chat bots, with only a few reviews, nothing like the sophisticated A.I. software being used by the Chinese Microsoft program in Beijing. Fundamental changes in brain structure and function during adolescence are well-characterized, but the extent to which experience modulates adolescent neurodevelopment is not. Musical experience provides an ideal case for examining this question because the influence of music training begun early in life is well-known. We investigated the effects of in-school music training, previously shown to enhance auditory skills, versus another in-school training program that did not focus on development of auditory skills (active control). We tested adolescents on neural responses to sound and language skills before they entered high school (pretraining) and again 3 y later. Here, we show that in-school music training begun in high school prolongs the stability of subcortical sound processing and accelerates maturation of cortical auditory responses. Although phonological processing improved in both the music training and active control groups, the enhancement was greater in adolescents who underwent music training. Thus, music training initiated as late as adolescence can enhance neural processing of sound and confer benefits for language skills. These results establish the potential for experience-driven brain plasticity during adolescence and demonstrate that in-school programs can engender these changes. Synchronizing brain theta oscillations strengthens our adaptive behavior control. The ability to exert control over our behavior is fundamental to human cognition, and is impaired in many neuropsychiatric disorders. Here, we show evidence for the neural mechanisms of adaptive control that distinguish healthy people from people who have schizophrenia. We found that the noninvasive electrical stimulation phase aligns low-frequency brain rhythms and enhances functional connectivity. This brain stimulation modulated the temporal structure of low-frequency oscillations and synchrony, improving adaptive control. Moreover, we found that causal changes in the low-frequency oscillations improved behavioral responses to errors and long-range connectivity at the single-trial level. These results implicate theories of executive control and cortical dysconnectivity, and point to the possible development of nonpharmacological treatment alternatives for neuropsychiatric conditions. Executive control and flexible adjustment of behavior following errors are essential to adaptive functioning. Loss of adaptive control may be a biomarker of a wide range of neuropsychiatric disorders, particularly in the schizophrenia spectrum. Here, we provide support for the view that oscillatory activity in the frontal cortex underlies adaptive adjustments in cognitive processing following errors. Compared with healthy subjects, patients with schizophrenia exhibited low frequency oscillations with abnormal temporal structure and an absence of synchrony over medial-frontal and lateral-prefrontal cortex following errors. To demonstrate that these abnormal oscillations were the origin of the impaired adaptive control in patients with schizophrenia, we applied noninvasive dc electrical stimulation over the medial-frontal cortex. This noninvasive stimulation descrambled the phase of the low-frequency neural oscillations that synchronize activity across cortical regions. Following stimulation, the behavioral index of adaptive control was improved such that patients were indistinguishable from healthy control subjects. These results provide unique causal evidence for theories of executive control and cortical dysconnectivity in schizophrenia. I'll use this post to point readers to several recent interesting articles on physical activity. Hutchinson does a review of work that distinguishes the effect of strength and endurance training versus balance and stability training. The former isn't all that useful without the later, especially in older adults (have you tried standing on one leg with your eyes closed lately?). A German study followed aged adults for 12 months comparing those who did cardiovascular (walking) exercise three times a week, with those who did coordination training. Both groups showed improvement in cognitive functioning, but in different ways. Cardiovascular training was associated with an increased activation of the sensorimotor network, whereas coordination training was associated with increased activation in the visual–spatial network. Mouse studies show that aerobic exercise and strength training trigger brain chemicals that enhance neuron growth and survival, while balance and coordination exercises also recruit higher-level cognitive processes that seem to increase the number of synapses connecting neurons. Work by Kumpulainen et. al. suggests that novelty and unpredictability (as in gymnasts or dancers), rather than repetition (as in endurance athletes), are essential in brain plasticity and engagement. In another item, Reynolds updates the story on the beneficial effects of intense interval training. Just a few minutes of very intense exercise are much more effective in improving health and cardiovascular fitness than slow and steady repetitive exercise. To try to deal with the problem that most people really don't enjoy zonking themselves out with intense intervals, Bangsbo and collaborators tried a different approach, asking runners to run gently for 30 seconds, then accelerate to a moderate pace for 20 seconds, then sprint as hard as possible for 10 seconds. Repeat five times, rest for a bit, and continue the sequence during a 5-km run. They observed the same beneficial effects on blood pressure and endurance observed with more arduous (several minute) bouts of high intensity training. I tried this 30-20-10 sequence with my favored aerobic exercise, swimming (just counting the intervals to myself made them pass more quickly), and I came out of the routine feeling way more wired than after my usual moderately active swim period. Brain correlates of the impatience of adolescents. Adolescence is a developmental period associated with an increase in impulsivity. Impulsivity is a multidimensional construct, and in this study we focus on one of the underlying components: impatience. Impatience can result from (i) disregard of future outcomes and/or (ii) oversensitivity to immediate rewards, but it is not known which of these evaluative processes underlie developmental changes. To distinguish between these two causes, we investigated developmental changes in the structural and functional connectivity of different frontostriatal tracts. We report that adolescents were more impatient on an intertemporal choice task and reported less future orientation, but not more present hedonism, than young adults. 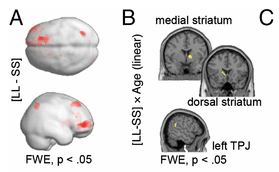 Developmental increases in structural connectivity strength in the right dorsolateral prefrontal tract were related to increased negative functional coupling with the striatum and an age-related decrease in discount rates. Our results suggest that mainly increased control, and the integration of future-oriented thought, drives the reduction in impatience across adolescence.